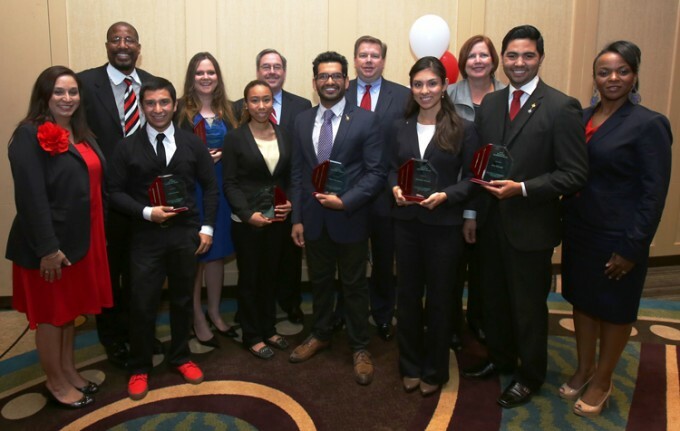 Six Bauer students (first row, second from left) Juan Lerma, Bianca Gevin, Timur Daudpota, Michelle Alvarez, Jose Estrada and (second row, second from left) Priscilla Harrington received the 2013 Ted Bauer Leadership Award during the 2013 Leadership Awards Luncheon for exhibiting active involvement, excellent academic records, community engagement and Bauer pride. Courage, initiative and determination are just a few qualities that define strong leaders. For six students at the C. T. Bauer College of Business, those leadership skills earned a top honor from the college during its annual Halliburton Leadership & Ethics Luncheon on April 12. At the event, the college presented the Ted Bauer Leadership Award to students who exhibited active involvement, excellent academic records, community engagement and Bauer pride. Honorees included marketing senior Jose Estrada, supply chain management majors Priscilla Harrington and Michelle Alvarez, finance major Juan Lerma, accounting major Bianca Geven and Timur Daudpota, a double major in supply chain management and entrepreneurship. For Kathryn Wheatley, a program manager for the Bauer Leadership Team, recognizing outstanding students was a highlight of the luncheon. Another high point, Wheatley added, was the keynote address presented by Lyn Beaty, vice president of audit & controls at Halliburton. During her talk, Beaty spoke to topics similar to what Bauer students learn through the college’s leadership program, reinforcing and strengthening those core concepts. The luncheon also helps to connect the college’s professional partners with Bauer students who excel in and out of the classroom, she added. During the event, the college awarded certificates to students completing the Ted Bauer Leadership Program, a number that has grown from 27 last year to 83 for 2013.